Recipe starts with cutting raw jackfruit into 6-8 inch pieces along with skin, boiling them. Once cooled down, it is easy to cut the skin. Boil water. Place cut jackfruit quarters in water. Cook for 10 mins or till soft. Turn off stove. 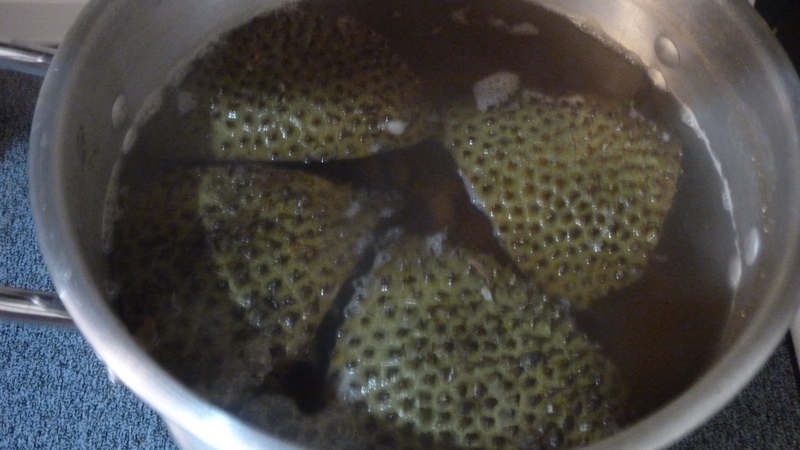 Remove jack fruit from water. Let them cool. Meanwhile roast masala powder ingredients and grind them to powder. Boil 3 cups of water and cook 2 cups of quinoa. When jackfruit cools down, cut and discard skin. Remove and discard seeds. You can use remaining meat. Cut meat into small (approx 1 inch) pieces. In a pressure cooker or a thick bottomed pan, heat Ghee. Add cumin, green chillies, onion cubes. Cook till light golden brown. 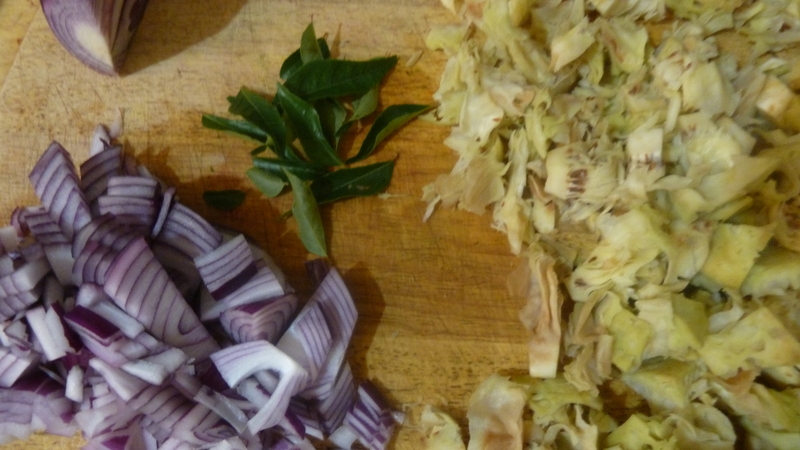 Now add jackfruit meat. Stir. Cook for 3 minutes. Add salt, chill powder, remaining masala powder. Close lid, cook for 3 minutes. 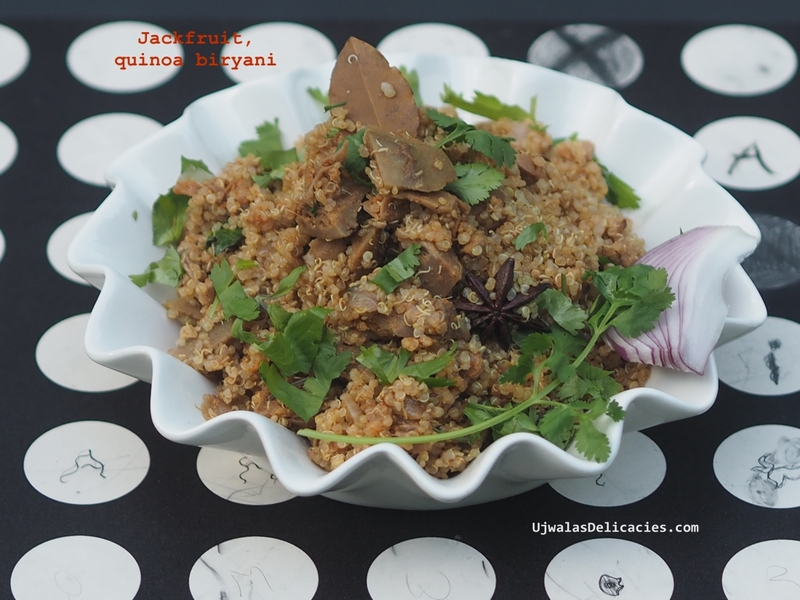 Place cooked quinoa on top of jackfruit. If you are cooking in pressure cooker, close lid, place weight if your cooker has one. Keep stove on medium high for 10 mins. Then turn to medium for 5 mins. Then turn off. If you are using thick bottomed pan, place an aluminum foil, then place lid tight on top. So that steam doesn’t escape. Keep stove on medium high for 10 mins, medium for 5 mins. Then turn off. In another way, you can transfer cooked jackfruit into aluminum tray. Place rice on top. Close tray with aluminum foil. Place this tray in another tray. So that foil is tightly sealed and steam doesn’t escape. Heat oven to 350º F. Now place tray in oven for 30 mins. When done, garnish with cilantro. Pour ghee on top.